Cook the gnocchi in a medium-sized pot of salted boiling water. After 2-3 minutes or as they float to the surface they are ready, so remove with a slotted spoon and set aside in four warmed bowls, with an extra drizzle of olive oil. To save on washing up, drain the water from the gnocchi pot, dry with kitchen paper and then on medium-high heat fry the bacon in a little olive oil for 5 minutes, or until crispy. Add in the cream, simmer gently for another minute and then remove from the heat and pour over the gnocchi servings. To another medium-sized pot of boiling water add 1 Tbsp white wine vinegar and then gently crack two eggs at a time into the water. 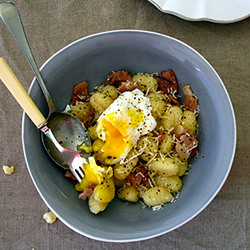 For a soft poach, remove after 2-3 minutes using a slotted spoon and place gently on two of the gnocchi servings. Repeat for the remaining eggs, then top each bowl with a generous pinch of salt and pepper and shavings of parmesan, as well as a small handful of fresh rocket and toasted pine nuts if you like. Serve immediately. Note: You could also substitute the gnocchi for penne or linguini for an even more budget friendly and lighter version.